The founder of the Art of Living Sri Sri Ravi Shankar arrived in Guwahati today in a visit that has created a lot of hope for peace-building in the North East. “I will interact with all sections of society. Various leaders from all the states of the North East are coming. We have to bring a new light, an atmosphere of peace to ensure fast development of the region. 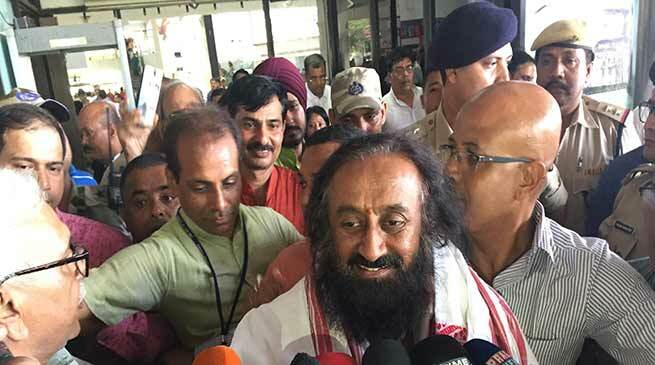 The development of northeast can only with the participation of all sections of society,” Sri Sri Ravishankar said soon after landing at Guwahati Airport. Sri Sri is on a special visit to interact with people from all sections of society in his bid to seek a shared vision for addressing the issues facing the region in non-violent and democratic ways. One of the highlights of the interactions will be his keynote address at a conference of opinion-makers and thought-leaders of the region. Christened STRENGTH IN DIVERSITY: North East Indigenous People’s Conference, the power-packed event is organized by many like-minded and prominent individuals and groups of the region. The event will bring leaders from all walks of life including leaders who have formerly taken up arms on a common platform to debate, discuss and bridge the gap among various stakeholders in the peace processes and reduce the trust deficits that exist. Several former underground leaders led by General Secretary of United Liberation Front of Assam (ULFA) Anup Chetia are among the conveners of the event. Other prominent names include former leader of armed Tripura National Volunteers Bijoy Kumar Hrangkhawl and Dilip Nunisa of Dima Halam Daogah, the Assam-based militant outfit that laid down arms in 2013. Apart from the organizers, the conference is also likely to see the attendance of a large contingent of leaders from Nagaland including former army chief of NSCN(IM) Lt Gen VS Atem and Wangtin Naga of NSCN(R) and top civil society leaders from Manipur such as President of United Committee Manipur (UCM) Elangbam Johnson and President of All Manipur United Club’s Organisation (AMUCO) Ph Debananda Sharma. Sri Sri has been pushing for peace in the region very proactively and is acknowledged to have played a big hand in the recent homecoming 68 militants in Manipur.